Anaconda Mining is the gold mining company at the heart of the local community in a small town in Newfoundland. Led by humble CEO Dustin Angelo, the junior producer has gone from strength to strength in his six years of stewardship. Anaconda now boasts a 16,000oz p/a commercial mine at The Point Rousse Project, a supplementary deposit at the Viking Project and a land holding of around 12,000 hectares with plenty of room for organic growth, exploration and an active M&A programme. Angelo is gearing the company to ramp up its production over the coming years and demonstrating ingenuity and outside-the-box thinking to achieve that goal. 2016 was another year which brought continued success for the Canadian gold miner: expanding the land holding, signing an innovative deal to monetise waste rock and scooping a number of company awards. Angelo says the company is riding a high right now but he is not happy to settle there. The determined CEO has ambitious plans to increase total production figures to 40,000oz p/a. Anaconda’s flagship Point Rousse Project consists of 6,300 hectares (ha) on the Ming’s Bight Peninsula located in the Baie Verte mining district in Newfoundland. In addition to several gold trends Anaconda has constructed an on-site processing mill at Point Rousse – the centrepiece of the complex. Upgrading the mill facility was the first major milestone under Angelo’s leadership and there have been many since. “It took us about nine months to commission and commercialise the mill and by May 2011 we were finally operating in the black,” says Angelo. The first fiscal year ending May 31st 2011 brought production of 5,000oz p/a and that figure has been steadily increasing to between 15,000-16,000oz p/a over the last couple of years – rates at which Anaconda has been able to turn a profit in recent years. After laying the foundations of production Anaconda picked up a land package of 6,300ha – having started with just 660ha – and Angelo says that was the ‘catalyst for finding other gold deposits in the immediate area of the mill’ and further exploration has continued. Having successfully stabilised production at Point Rousse, Angelo focused his attentions further afield. In February 2016 Anaconda acquired the Viking Project which nearly doubled the overall land package. In addition to the Viking purchase Angelo also signed deals for a known resource called the Thor Deposit and another two projects. “All four projects are in areas that are highly prospective, they are off major fault zones, which are key characteristics for finding gold. We’ve got an organic growth plan for exploration and a clear strategy for greater Atlantic Canada,” highlights Angelo. With the overarching goal of increasing total production, over the last six years or so Angelo has taken a single flagship operation and turned it into a commercially producing mine supplemented by exploration assets. This was further demonstrated by the March 2017 acquisition of Orex Exploration and its Goldboro project. The primary benefit of the deal is to leverage Anaconda’s existing infrastructure against the project to substantially reduce capital cost and it matches Anaconda’s strategy of bringing in high grade localised projects. However, Anaconda’s operations would be distinctly less impressive without the mill processing facility which is the centre piece of the localised infrastructure. The mill has increased in throughput from 700 tonnes per day (tpd) at the beginning of Angelo’s reign to at least 1,300tpd, sometimes pushing 1,600tpd. It means that Anaconda can process vast amounts of ore on site, firstly reducing expensive transport costs and secondly seeing the actual gold doré bars made at the mine. The mill, and the means of getting ore to the mill, could be the keys that unlock the potential of the region for Anaconda. The company has built a port on the Baie Verte harbour primarily for the exportation of waste rock, however Angelo sees the possibility of it being used for importing ore from supplementary projects to be processed at Point Rousse. “It opens up Atlantic Canada to other possibilities for us to import more. It opens the area for other gold deposits that may not be economical on their own – if we have to build an entire infrastructure play. The original purpose of the port was to facilitate the innovative waste rock project. Anaconda entered an agreement with Shore Line Aggregates and Phoenix Bulk Carriers in October 2016 for a 3.5mt aggregates contract to the US eastern seaboard over 14 months. Anaconda is now able to monetise the waste rock from its Point Rousse Project, removing the costly disposal of waste rock and creating an additional revenue stream at the project – a stroke of operational genius by the management team. 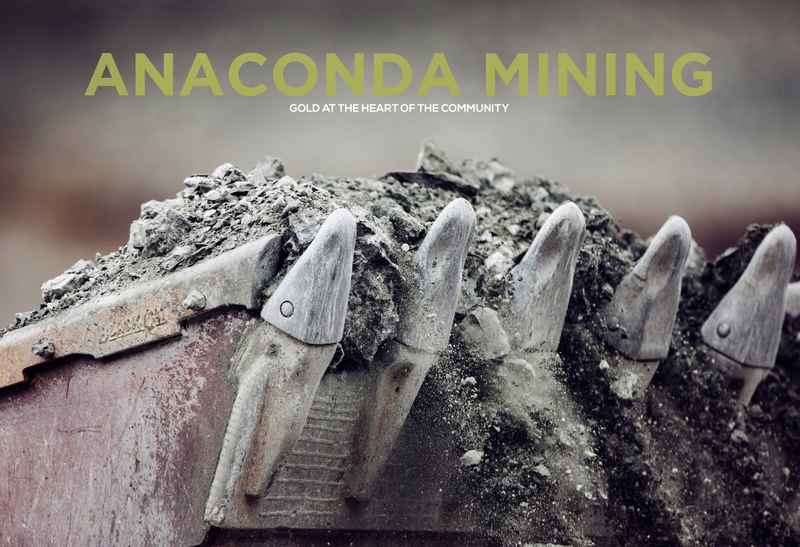 Anaconda will receive approximately $2 million over the contract period and there are several exponential benefits to the miner: no capital is required for the project, thanks to the port there is a shorter haul distance meaning lower mining costs, there is potential for future aggregates contracts and it facilitates the opportunity to import ore from other projects. “It’s been a big win and has added about 70 jobs to the project area. It’s a big boon for the local economy and the local community, all round it’s been a great project,” observes Angelo. Turning the focus back to operations Angelo is targeting successful exploration and organic growth to step up to the 40,000oz p/a mark. The first hurdle is to demonstrate there is more resource potential at both Point Rousse and Viking and by doing so bring multiple deposits into production and feeding into the mill. Anaconda has identified the Argyle Prospect at Point Rousse and has drilled out a significant strike length which has delivered what Angelo calls ‘some very good results in terms of intersections of mineralisation and pretty good grade’. The highlights of the first 1,638-metre drill programme included intersections of 2.09g/t over 14m, 6.09g/t over 8.9m and 4.50g/t over 6.3m. The second 2,174m drill programme, completed on January 18, showed highlights of 5.52g/t over 15m, 9.31g/t over 6m, 2.95g/t over 15m and 2.91g/t over 12.1m. Argyle outcrops at surface and would only require a short 4km haul back to the mill, which means the prospect could be incorporated into the project with very low associated costs and would lead to a step up in overall production figures. The Viking Project will also be in the front of Angelo’s mind in the coming year as Anaconda aims to fill out the Thor deposit to a five-year mine life. Currently, the deposit has roughly two years’ worth of mining at 25,000-30,000oz p/a production. Angelo is planning to drill out the surrounding area of the deposit to prolong the production timeline. The product from Viking would concentrated and brought back to the mill for processing increasing Viking’s potentiality all the while reducing costs. However, both projects require overcoming distinct challenges. At the Thor Deposit Anaconda has to undertake a drilling programme to find a further three years of resource in the ground, on top of the two that is available and at Argyle there is no 43-101 on the resource yet so that will require more drilling too. The major question Angelo faces over the next two years is whether the ounces exist in economic quantities and if they are economically viable to get out of the ground. Although Angelo has a clear plan of how Anaconda is going to tackle the next year and bring success on all front. While 2016 saw a number of big success for Anaconda, Angelo is quick to stress how important the workforce and personalities in the company are to the end goal. Anaconda has been recognised across the industry as one of the most exciting junior miners picking up several awards. Despite the CEO picking up personal awards too his most prized gong in 2016 was the company being named one of the ‘top 30 best places to work in Atlantic Canada’, which is a survey completed by the employees. “It demonstrates people like working at Anaconda, they appreciate everything about it and coming from within it is a better validation of what we are doing. The recognition is fantastic and it’s a testament to the people in the company that have worked hard for a long time to build our project. The real story for Anaconda Mining is the way the company and its leadership team have championed the local area. Whether it be through ensuring the workforce are from the region – nearly all employees live within a five minute to one hour drive from the mine – committing funds and resources to local community centres and activities or hiring local companies throughout the supply chain, Angelo has endeavoured to make sure the Baie Verte community benefits from the work and employment at Anaconda. Through the employment opportunities in highly skilled, technical jobs at the mine Anaconda is helping to retain young, talented people in the area and stem the overall flow of the reducing population which has dwindled from 3,000 people into the 1980s to around 1,400 today. It’s hoped that with continued success on the operations side and the expansion of other projects in the region Anaconda can continue to contribute to employment numbers and the local economy in Baie Verte for the foreseeable future.